The Miami University department of music will host two special performances: concert:nova + Jeffrey Ziegler at 8 p.m. Wednesday, March 11, in 102 Benton Hall and the Shanghai Jiao Tong University Symphony Orchestra at 8 p.m. Thursday, March 12, in Gates-Abegglen Theatre, Center for Performing Arts. Both performances are free. concert:nova, a chamber ensemble of musicians from the Cincinnati Symphony Orchestra, will present a series of performances in the region as part of Cincinnati's MusicNOW Festival March 11-15. At Miami, concert:nova will perform alongside cellist Jeffrey Zeigler, described as "one of the most cutting-edge and versatile performers of today." Zeigler has been the cellist of the internationally renowned Kronos Quartet for eight seasons and collaborates and innovates with interdisciplinary and multimedia ensembles around the world. Caroline Shaw, who in 2013 became the youngest winner of the Pulitzer Prize for music, will also join the ensemble, performing one of her compositions. Shaw is also a Grammy Award-winning singer in Roomful of Teeth. 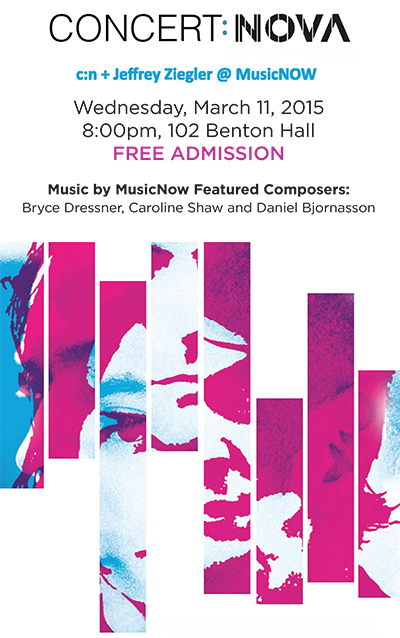 The concert also features works by MusicNOW composers Bryce Dessner and Daniel Bjarnason. This concert is sponsored by the departments of music and mechanical and manufacturing engineering and by the College of Engineering and Computing. 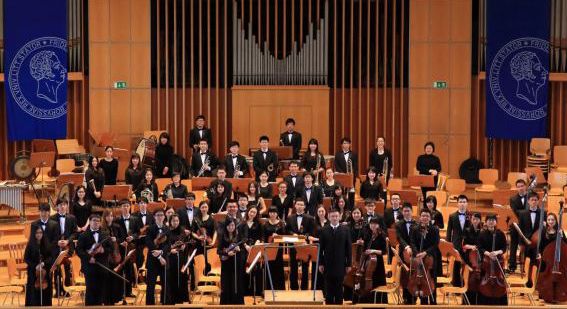 The Shanghai Jiao Tong University Symphony Orchestra concert March 12 is part of the College Orchestra Directors Association (CODA) 2015 International Conference. The conference, co-hosted by Miami and Northern Kentucky University, will be held in Cincinnati March 12-14. Conducted by Wu Yibo, the orchestra will perform Mozart's "Overture to The Marriage of Figaro"; "Taiwan Folk Song Suite" by Liu Yuan; "Overture Reba Dance" by Fang Ke Jie; Franz Schubert's “Unfinished” symphony; and "Medea’s Dance of Vengeance" by Samuel Barber. This concert is sponsored by CODA and the Confucius Institute at Miami University. Also, the Miami University Symphony Orchestra will perform at 2 p.m. Saturday, March 14, in Hall Auditorium. The free concert, conducted by Ricardo Averbach — president of CODA and director of orchestra studies at Miami — is in conjunction with the CODA International Conference.